The Haynesville Shale rig count took a pretty good jump this week, up six rigs to 184. The biggest increase was in Louisiana, which bumped up five to 136, the highest count this year. Texas increased by one to 48. The weekly Baker Hughes rig count showed a one rig increase in the U.S., bringing the total working rigs to 1,586. This figure is 81% higher than the recent low achieved in June 2009. 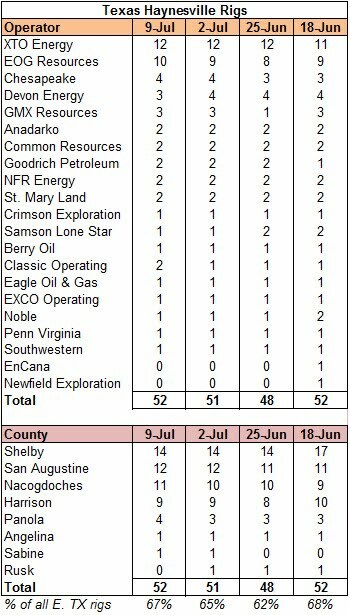 During the week, gas rigs dropped by 10 to 972, while oil rigs increased by 12 to 603 and directional wells dropped by one to 11. By type, vertical rigs increased by four and directional rigs increased by two while horizontal rigs decreased by four. 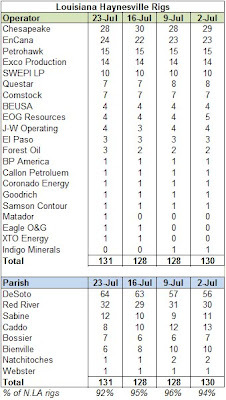 In the Haynesville region, inclusive of other formations, the rig count increased by two to 215. North Louisiana was up one to 143 and east Texas was up one to 72. The detailed Haynesville rig count will be up by late afternoon or tomorrow. Last week, Ellora Energy announced that the company had reached an agreement to be sold for $695 million to an undisclosed buyer. Last year, the company announced its intentions to "consider its strategic alternatives." Not unexpectedly, the best strategic alternative was to spit the company's Kansas/Colorado and east Texas operations and sell them separately. Earlier this year, the company sold its western operations. Ellora has 46,000 net acres in the Haynesville Play along the Texas/Louisiana border in Shelby Co., DeSoto Parish and Sabine Parish and a 100 pipeline system on the Texas side. I eagerly await finding out who bought the company. The weekly EIA working gas in storage report showed a 29 Bcf increase, bringing the total gas in storage to 2.919 Tcf. This week continues the string of net injection levels that are below last year's injection (+70 Bcf) and the five year average (+50 Bcf). The current storage level is now 3.1% below last year's level and 8.9% above the five year average, yet another big improvement. Warm temperatures seemed to be the driver for lower than normal storage injections. Temperatures in most areas were thee to five degrees warmer than usual. Interestingly, the storage levels in both the Producing Region and the West Region went down, albeit slightly, which is nearly unheard of in the month of July. Don't worry about a sudden crisis, as the current levels in the Producing Region are 14.6% higher than the five year average and 22.9% higher than average in the West Region. The East Region, which is the largest of the three regions in terms of capacity, is keeping the overall storage levels tethered to earth, as it is only 1.7% higher than the five year average. 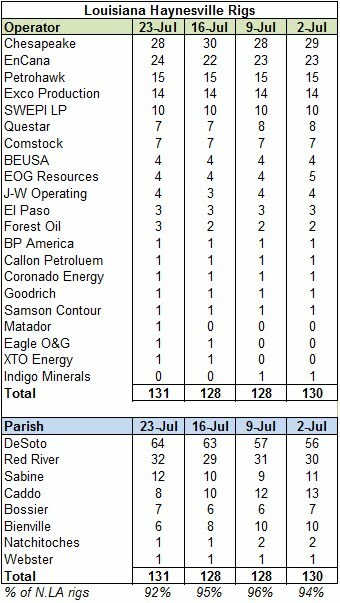 The Louisiana DNR only reported one new completion this week. The revised spreadsheet with the new Questar completions and the new maps have been published. Last week, EnCana released its second quarter earnings and operations update. EnCana has consistently maintained the second largest number of rigs in the play, averaging 22 for the past six months but currently at 26. This high count is a necessity for a company with a big chunk of its 459,000 net Haynesville acres that it needs to hold by production. In a previous post I provided greater detail on the company's land retention strategy, so I'll gloss over it here, only to say that this strategy is driving the big rig count. Is it sustainable after 2012? There are a lot of variables involved. EnCana has elevated the Haynesville Shale to be a "key resource play" for the company. Not sure what that means other than an indication that the company will shine a brighter light on the play internally. That's a good thing because EnCana also announced that it has increased its 2010 capital budget by $500 million. Last week, Mainland Resources finally started drilling a well in Jefferson Co. Mississippi that the company believes is prospective for the Haynesville Shale. The project has been discussed for a long time, but the Burkley Phillips #1 well in the Buena Vista Prospect is soon to be a reality and we can all see if the Haynesville Shale extends to Mississippi. The well will be drilled to 22,000 feet and is expected to cost $13.55 million ($8.65 million to drill, $4.9 million to complete). I'm assuming it will be a vertical completion, as Mainland believes that the shale is 2,500 feet thick (!!!) with 20,000 psi of pressure based on data obtained from Chevron, which originally drilled a well on the site in 1981. Mainland has leased 17,500 acres of land in Mississippi and Tensas Parish, Louisiana in hopes of someday having 255 potential drilling sites (80 acre spacing). As evidenced by a recent article in the Natchez paper, the locals are starting to get excited. I've been somewhat skeptical about the prospect of such a rich find, but I am eager to see what comes of the well. I will readily admit the error of my ways if the well is a success. I never got around to discussing the fact that Questar spun out its E&P subsidiary, QEP Resources, in late spring. The basic rationale is that the company wanted to separate its faster growing E&P business from its slower growing utility business in an effort to squeeze more value out of each. You may recall that EnCana did the same a little while back, separating its natural gas-focused E&P (which kept the name EnCana) from its slower growing oil business (now named Cenovus). I'm not good with new names (ask of my female friends who got married in the past ten years), so I'll probably still call the company Questar. In any case, Questar reported its earnings today and provided a brief operational update. 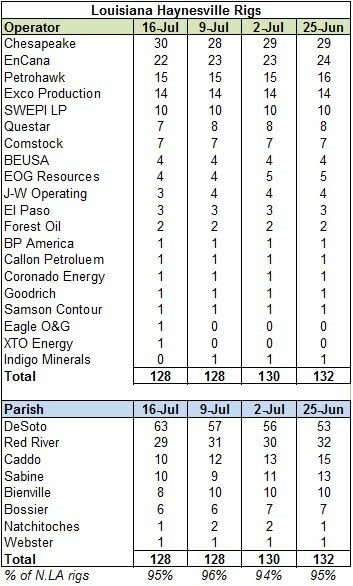 First thing I noticed is some more acreage under Questar's control, with the company's net Haynesville acreage increasing from 46,000 six months ago to 49,000 today. As of June 30, 2010, Questar is producing 178 MMcf/day in the Haynesville Shale. Questar always seems to quietly chug away. It is running seven operated rigs now and is using a restricted choke technique, a la Petrohawk, on its new wells to minimize pressure drawdown at the reservoir. Using this technique, the company has experienced a relatively flat production profile for the first four to nine months before seeing a noticeable decline. The trade-off is lower initial production rates. I will lump these completions in with last week's on the spreadsheet and upload a revised version. I will also update the maps. Crane ETAL #1H, EOG Resources: 31.175 MMcf/day IP, 26/64" choke; Carthage Field (Haynesville Shale), Nacogdoches Co.
Murray Gas Unit #1H, EOG Resources: 24.921 MMcf/day IP, 25/64" choke; Carthage Field (Haynesville Shale), Nacogdoches Co. Hull Unit A #A103H, Devon Energy: .335 MMcf/day IP, Adj./64" choke; CarthageField (Haynesville Shale), Panola Co.
Roadrunners DU #1HR, XTO Energy: 7.204 MMcf/day IP, 12/64" choke; Carthage Field (Haynesville Shale), Shelby Co.
Jenkins East GU #3H, Berry Oil; Carthage Field (Haynesville Shale), Harrison Co.
Bosh #17H, GMX Resources; Carthage Field (Haynesville Shale), Harrison Co.
Hurricanes DU #1H, XTO Energy; Carthage Field (Haynesville Shale), Shelby Co.
Samford #1H, Chesapeake Operating; Carthage Field (Haynesville Shale), Shelby Co. The revised Texas completions spreadsheet has been uploaded to the site. 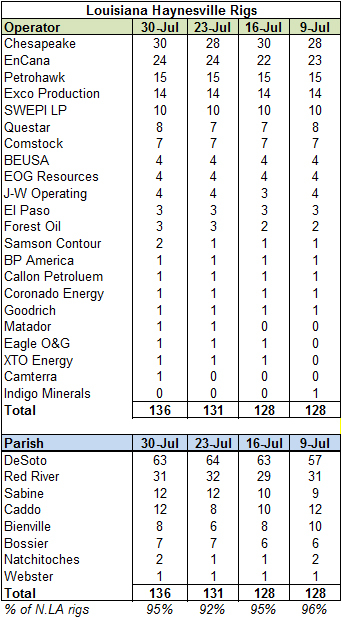 The Haynesville Shale rig count increased by one to 178 this week. 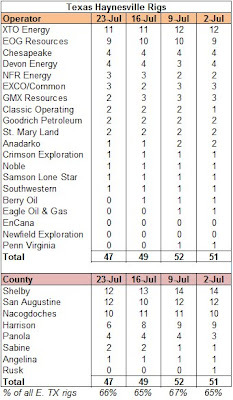 In Louisiana, the rig count increased by three to 131, while it dropped by two in Texas to 47. In Texas, please note that following the closing of the Exco Resources acquisition of Common Resources I have consolidated Common's wells under Exco. I made a couple of changes to the list of Mid-Bossier wells. I deleted the Cabot Oil & Gas King Gas Unit #1H and added the EOG Resources Bennett Gas Unit #1H Both are in San Augustine Co. TX. The drilling rig left the Bennett well in mid-June and I understand that completion operations began in late July. I also added a note clarifying the Cabot Katherine Von Goetz #3. This is a vertical well that tested several different formations including the Mid-Bossier. While not strictly a Mid-Bossier well, I kept it on the list for now. I've got leads on a few more Mid-Bossier wells but haven't had the time to do the digging. Hopefully I'll have more on them soon. The weekly Baker Hughes rig count showed a continued growth in working rigs, increasing this week by 14 to 1,585. Most of the growth was in oil-targeted rigs, which increased by 11 to 591, while gas-targeted rigs increased by three to 982. By type, vertical rigs jumped 11, while directional rigs increased by four and horizontal rigs decreased by one. Horizontal rigs still make up 54% of the working rig fleet, compared to 43% this week last year. In the Haynesville Shale region, inclusive of other formations, the rig count increased by three to 213, with a seven rig increase in north Louisiana to 142 and a four rig decrease in east Texas to 71. The detailed rig count and updated map should be ready by late afternoon. I'm in the process of making some physical changes to the site to make it easier to use and more aesthetically pleasing (at least to me). I also intend to add some new features as time permits. Please don't be alarmed with frequent changes. The most notable change today is that I've condensed the links to maps, completions, rig counts and Mid-Bossier Shale information into links at the top of the page. All of the information is still there, but it's in a slightly different format. The weekly EIA storage report showed that the net injection level for the week continues to stay below the five year average injection. The weekly injection was 51 Bcf, bringing working gas in storage to 2.891 Tcf. This compares very favorably to last year (+70) and the five year average (+64). Now, the current storage levels are 52 Bcf lower than last year (-1.8%) while still being 261 Bcf higher than than the five year average (+9.9). While the current levels are still high, they are not 19% over the five year average as they were back in May. The temperatures last week continued to be high, which likely lessened the net injection. The International Energy Agency reported yesterday that China took the dubious honor of world's #1 energy consumer in 2009 (a claim that China now disputes). As the chart below from the Wall Street Journal shows, The trend has been been in place for the past decade. The IEA suggests that the severity of the recession in the U.S. and its lesser impact in China is the main reason for the change in position, but looking at the chart above, even if the U.S. energy consumption had held pace last year, it would probably have been a tie score. The Daily News & Analysis reported that India's largest company Reliance Industries is looking at Ft. Worth-based Quicksilver Resources as a possible deal target. A potential transaction might be a joint venture or a takeover. It seems the company's Horn River shale assets are particularly attractive, and Quicksilver likely lacks the financial resources to exploit its Horn River acreage on its own. A transaction with Quicksilver would be Reliance's third North American shale gas deal in as many months. I've long been fascinated by the concept of the "resource curse," whereby countries with vast natural resources often become morally/economically bankrupt kleptocracies that are beset with intense poverty while a narrow band of society grows very wealthy. During the 1980's, when the energy companies largely relocated the industry's wealth by moving their offices from Louisiana to Houston, taking the leases but leaving behind the environmental damage, Louisiana's fate as a victim of the resource curse was sealed. The explosion of the Deepwater Horizon and the resulting oil spill has served to remind us all where Louisiana stands in the grand scheme. We are at the center of production but we have little control over our own fates. But that's not to say that we, or more correctly our ancestors, were not complicit in the satanic pact. Unfortunately, like most co-dependent relationships, we are back in big oil's arms soon after being wronged. We have nowhere else to run. Meisenheimer #1, EOG Resources; Carthage Field (Haynesville Shale), Nacogdoches Co.
Young Heirs Gas Unit #1H, Devon Energy; Carthage Field (Haynesville Shale), Rusk Co.
C. Crest #1H, Southwestern Energy; Carthage Field (Haynesville Shale), Sabine Co.
Boone #1H, St. Mary Land + Expl. ; Carthage Field (Haynesville Shale), Shelby Co.
Vols DU #1H, XTO Energy; Carthage Field (Haynesville Shale), Shelby Co. 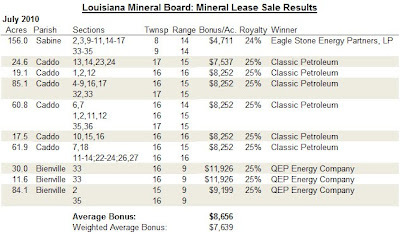 The Louisiana Mineral Board held its monthly lease sale last week, and the average bonus for acreage in the Haynesville Shale region was $8,656. The weighted average based on parcel size was $7,639. All winning bids but one had a 25% royalty rate (the other one was 24%). Please keep in mind that this is not a definitive answer to the current market rate for Haynesville bonuses; rather it is another data point to keep in mind. Bonuses vary by location, parcel size and a host of other factors. 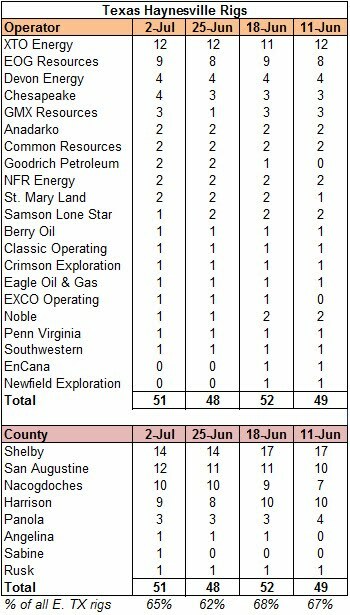 The weekly Haynesville Shale rig count showed a three rig decrease to 177. 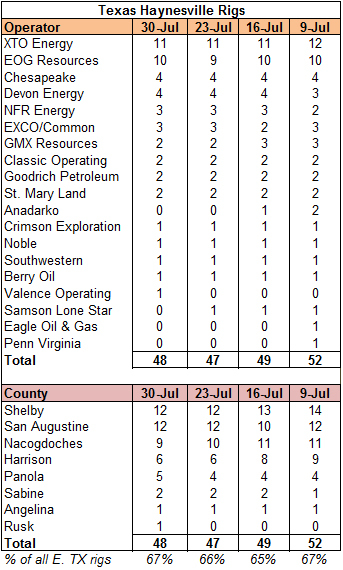 Texas saw the full three rig loss to fall to 49 working rigs, while north Louisiana held at 128 rigs. The weekly Baker Hughes rig count showed a four rig increase to 1,571, the highest level since June of last year. Gas rigs jumped by 15 to 979, their highest level since mid July last year and an increase of 47% since then. Oil rigs dropped by 12 whule miscellaneous rigs increased by one. By trajectory, vertical rigs jumped by 20, while horizontal rigs dercreased four and directional wells dropped by 12. 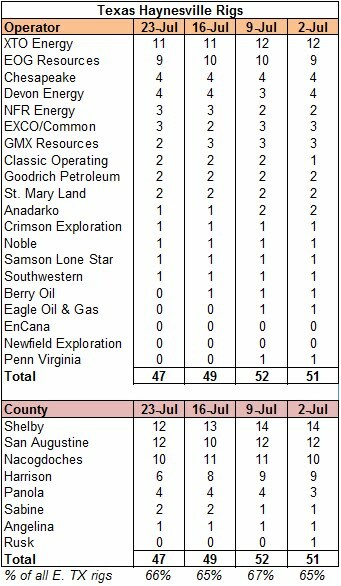 In the Haynesville Shale region, inclusive of other formations, the rig count decreased by two to 210, as north Louisiana added one rig to 135 and east Texas dropped three rigs to 75. For the second straight week, the EIA weekly report of working gas in storage showed a 78 Bcf net injection, this time bringing the total storage amount to $2.84 Tcf. This week's figure is lower than the same week last year (+88 Bcf) and the five year average (+89 Bcf). The current storage levels are 1.1% lower than last year's levels but 10.7% higher than the five year average. The differential between current levels and the five year average have been narrowing for the past month, but the weekly increment is so slight that I'm sure the market is not impressed. With the intense heat in the Northeast making the news last week I was expecting a lower injection number, but in looking at the temperature maps, the heat wave didn't seem that statistically severe, no matter how many people claimed to fry eggs on the sidewalks of New York. Nobody likes to tell their secrets. But Range Resources has announced that it will disclose the chemicals used in hydraulic fracturing in its Marcellus Shale operations. Range is one of the biggest Marcellus operators and the company's CEO John Pinkerton has said in the past that he favors disclosure of the fracking chemicals. I look forward to the first disclosures and the reactions on both sides of the fracking debate. I wonder exactly how wide the proverbial kimono will be opened. I am also eager to see if any of Range's peers follow the company into the bright light of disclosure. I'm all for the disclosure of these chemicals. It will shed light on exactly how much of the most controversial chemicals are actually part of the mix. There are folks running around the country making outrageous false claims about the components of fracking fluid. Hopefully this will lead to greater understanding by the public. But the sun shines both ways. Disclosing the chemical secret sauce will show that some unpleasant chemicals are used in the fracking process, albeit in small quantities. But disclosure should accelerate the process of replacing some of the more controversial chemicals with more environmentally friendly substitutes. That would be a win-win. To me Range's action is indirect fallout from the BP spill in the Gulf of Mexico. The realization that the spill likely is the result of the BP's poor practices has emboldened foes of the natural resources industries. Companies and industry groups that bury their heads in the sand and dig in for a fight only make things worse. Expect more regulation at the federal and state levels and more resistance from grass roots (or AstroTurf) organizations. Right now the natural gas industry is guilty until proven innocent (or at least not guilty). Hopefully Range's actions are a step towards clearing the industry's name. India's Reliance Industries Looking at Third North American Shale Gas Deal? Several Indian newspapers are reporting that Reliance Industries, India's biggest and best known company, is close to making its third North American shale gas deal in three months. Reliance bought 40% of Atlas Energy's Marcellus Shale acreage and 45% of Pioneer National Resources's Eagle Ford Shale assets in the past couple of months. Reports did not disclose the target company or shale formation. If the investment does come to fruition, I have my doubts that it will be in the Haynesville Shale, but I'm prepared to be wrong. Reliance favors investing in companies that maintain tight cost controls. Both EnCana and Chesapeake are talking to Asian companies about joint venture opportunties. While I'm not sure the Reliance and Chesapeake would make great partners, I'm sure Reliance would like to attend the Great International Shale School at Chesapeake U. to be able to apply shale gas lessons on the Indian subcontinent. The Wall Street Journal reported last week that Chesapeake Energy is seeking suitors in China for a 20%investment in its Eagle Ford Shale acreage as well as possibly a 10% share of its Marcellus Shale assets (Norway's StatoilHydro is already a minority investor in this acreage). Chesapeake recently sold $1.7 billion of preferred stock to Asian investors, but it is likely that the next in a long line of Chesapeake partners will be an operating company to learn at the feet of the perceived master. It is not the first time that Chesapeake has entertained a Chinese joint venture. Two years ago, Chesapeake was in talks with China National Petroleum Corp. for minority stakes in either the Fayetteville or Marcellus Shales. Recently, EnCana announced that the company is in discussions with China National Petroleum Corp. for a joint venture for some of its western Canadian shale assets. China will continue to be an interesting shale gas story. Much is being made of shale gas in Europe, but with the myriad of international boundaries and high level of urbanization there are lots of obstacles to realizing the dream on The Continent. China, on the other hand, has a large contiguous land mass, a strong central government and a demonstrated ability to realize ambitious goals. It also has an insatiable need for energy and an increasing desire to do some "social climbing" on the world stage. A viable domestic natural gas industry would fit in nicely. It could help China reduce its dependency on coal and foreign oil. China has had to forge some uncomfortable (and expensive) international relationships to feed the machine. It has also been branded as the world's biggest polluter. Keep your eyes on China. I think they get it. 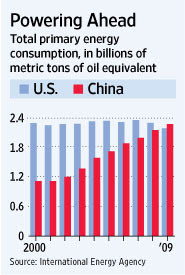 It will be interesting to see to what extent Western companies can participate in Chinese shale. I imagine a partnership agreement like Chesapeake and EnCana are contemplating is a good first step. Chad Ellis Gas Unit #2H, Samson Lone Star: 10.454 MMcf/day IP, 22/64" choke; Carthage Field (Haynesville Shale), Harrison Co.
Carthage Gas Unit 13 #17H, BP Americas: 3.461 MMcf/day IP, Adj./64" choke; Carthage Field (Haynesville Shale), Panola Co.
W.L. Liston #7H , XTO Energy: 5.538 MMcf/day IP, 17/64" choke; Carthage Field (Haynesville Shale), Panola Co.
Lewis Werner Sawmill #13H, XTO Energy: 3.279 MMcf/day IP, 24/64" choke; Carthage Field (Haynesville Shale), Panola Co.
Bailey Sheppard GU 2 #12HH, Anadarko E&P: 5.205 MMcf/day IP, 28/64" choke; Carthage Field (Haynesville Shale), Rusk Co.
Rajin Cajuns #1H [Ed. : *Cringe*], XTO Energy; Carthage Field (Haynesville Shale), San Augustine Co.
Marvin Hardy Gas Unit #1H, EOG Resources; Carthage Field (Haynesville Shale), San Augustine Co.
Kodiak #1, Crimson Exploration; Carthage Field (Haynesville Shale), San Augustine Co.
Mohon GU #15HH, NFR Energy; Carthage Field (Haynesville Shale), Harrison Co.
Letourneau GU 3 #26HH, Anadarko E&P; Carthage Field (Haynesville Shale), Harrison Co.
Hamilton #1H, GMX Resources; Carthage Field (Haynesville Shale), Harrison Co. The weekly Haynesville Shale rig count dropped by one to 180. Louisiana lost two rigs to finish the week at 128, while Texas gained one rig to end at 52. The weekly Baker Hughes rig count showed a ten rig increase, bringing the total rig count to 1,567. Oil rigs were up five to 592, gas rigs were up four to 964 and miscellaneous rigs were up one to 11. By type, horizontal rigs were up 14 to 863, while vertical rigs were down four to 226. As one might expect, horizontal rigs have grown significantly as a percentage of total rigs, increasing from 42.6% this week last year to 55.1% this week. In the Haynesville shale region, inclusive of other formations, the rig count was down by five to 212. 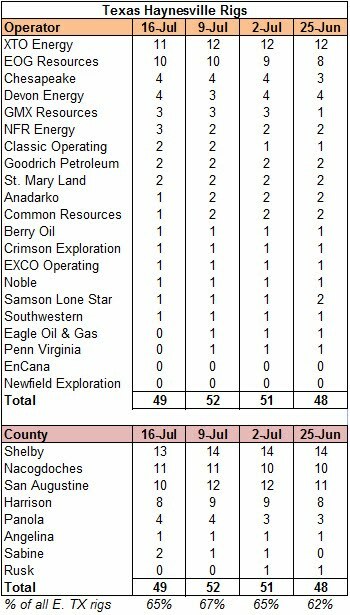 North Louisiana dropped four rigs, while east Texas declined by one. It remains to be seen if this is a trend or just the impact of a slow holiday week. The weekly EIA working gas in storage report showed a 78 Bcf net injection, bringing the gas in storage number to 2.762 Tcf. The net injection is in line with last year's figure (+74 Bcf) and the five year average (+80 Bcf). The current level is now 23 Bcf, or 0.8%, lower than last year's figure and 285 Bcf, or 11.5%, higher than the five year average. I'll be interested to watch next week's release to see how the extremely hot temperatures in the Northeast impact the storage injection. I have been watching reports of electricity conservation measures and brownouts as temperatures approach and eclipse 100 degrees in major metropolitan areas like New York City and Philadelphia. 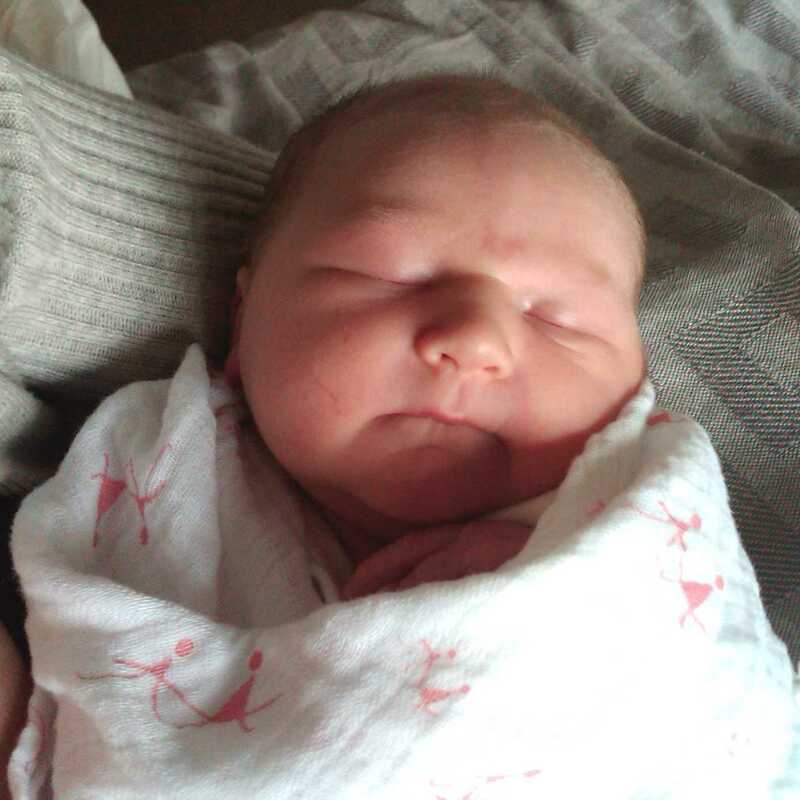 Our daughter Marcelle Hutchinson was born Tuesday July 6. 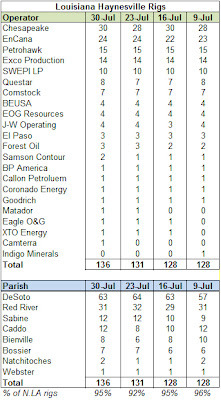 I will hold off on updating the spreadsheet until later this week when DNR reports the week's completions. Red River 442 #1H, Exco Operating; Carthage Field (Haynesville Shale), San Augustine Co.
Clark #1H, St. Mary Land + Expl. ; Carthage Field (Haynesville Shale), San Augustine Co.
Christine #1H, Chesapeake Operating; Carthage Field (Haynesville Shale), Shelby Co. I have not updated the spreadsheet for the one completion. I'll update it next week or if I see more completions later this week. The weekly Haynesville Shale rig count showed a one rig net increase, bringing the total to 181. Louisiana saw a two rig decline, while Texas saw a three rig increase. 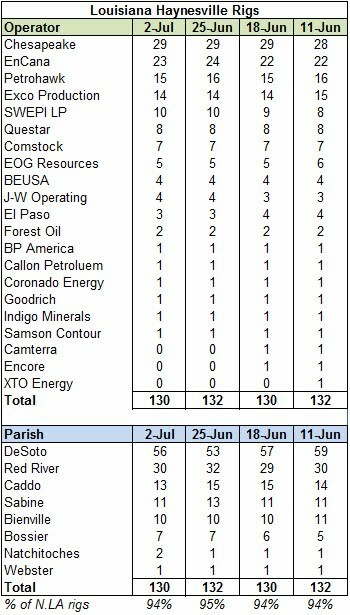 Of note, one rig was added in Sabine Co., TX and a second rig was added in Natchitoches Parish, LA. The weekly U.S. Baker Hughes rig count showed a five rig increase to 1,557. Oil rigs increased by four, gas rigs by two and miscellaneous rigs were down one. By type, horizontal rigs jumped by 16, while vertical rigs were down six and directional rigs were down five. 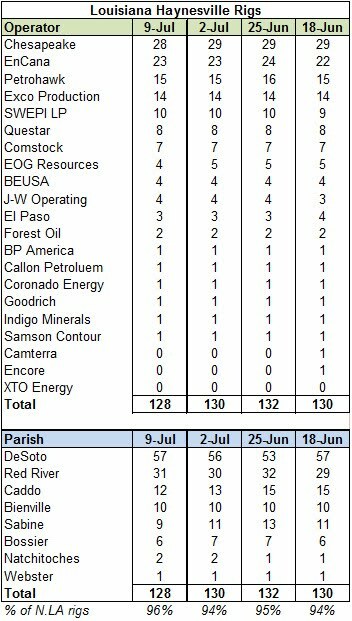 In the Haynesville region, inclusive of other formations, the rig count was up one to 217, increasing by two in east Texas and decreasing by one in north Louisiana. Last week, EnCana announced that the company had signed a memorandum of understanding with China National Petroleum Corporation (CNPC) that is expected to lead to a joint venture to develop EnCana's leases in the company's British Columbia shale plays, the Horn River, Montney and Greater Sierra. A formal JV agreement likely is a couple of months away, and the MOU is non-binding. The JV would accelerate EnCana's development of these fields, where EnCana has about 2.7 million acres under lease. "CNPC would invest capital to earn an interest in the assets and gain an advanced understanding of unconventional natural gas development through an ongoing sharing of technical knowledge." China has demonstrated an openness to pursue shale within its own borders. Sinopec subsidiary China Petroleum & Chemical Corp. has already a specialized project team to develop domestic shale gas resources. The country is also investing heavily in LNG import capacity. It's probably not reasonable to suggest that China is bound for energy independence or a natural gas-based economy any time soon, but can you imagine the enormous change that could occur in the worldwide geopolitical dynamic if China were no longer dependent on "rogue nations" for oil? T. Boone Pickens should start talking to the the Chinese about natural gas trucks! Hell, Warren Buffet has already invested in BYD, a Chinese electric car maker. That's starting to look like a smart decision for a very smart investor. The argument that China builds a new coal-fired power plant every "x" number of days has retarded progress towards larger environmental goals for the past decade. If China starts substituting gas-fired plants for coal-fired plants and we might start to see some real progress towards reducing carbon output. Wouldn't it be interesting to see China exploit a technology developed in the U.S. and take it to great heights? Sounds like a familiar storyline to me. The EIA working gas in storage report showed that natural gas storage levels only increased +60 Bcf to 2.684 Tcf. The weekly increase compared favorably to last year's injection (+73 Bcf) and the five year average (+82 Bcf). The current storage levels are now 1.0% below last year's figure and 12.0% above the five year average. Both of those differentials have been dropping over the past month.